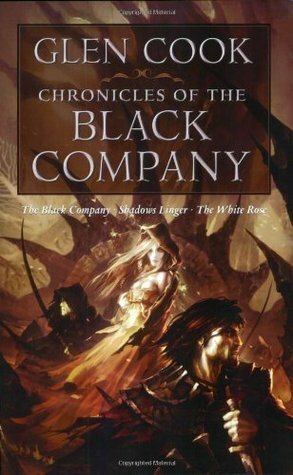 This is a review of “Chronicles of the Black Company” by Glen Cook, which gathers “The Black Company”, “Shadows Linger” and “The White Rose” in one omnibus edition. Apart from an expansive and rather wonderful, incredibly expansive and magical world, the book had a light writing style which was very easy to read, I practically raced through. Both the attitude of the writing and the word-choices contributed to this, and the characters were easy to like despite their chosen profession. I was even surprised and definitely a bit sad when the Captain died and when Elmo was feared dead, too. I also enjoyed the fact that the Black Company really doesn’t care about who’s right and who’s wrong at the start of the story. I also kind of like that they slowly started to care about it. Especially when the White Rose turned out to be Darling. That is another thing that I like, they don’t really like killing children or even fighting or killing people if there is another way out, but they will fight and fight to the last man if they actually have to. The father-daughter relationship between Raven and Darling was really wonderful, which is why I’m not certain exactly what I think of their developing relationship into a Raven-Darling-Silent triangle, but I did thoroughly enjoy the ending and the thing that happened between the Lady and Darling. I really not certain what I think about the relationship between Croaker and the Lady. The Lady herself, although a very strong character, is surprisingly weak and not-bad. She isn’t good, but she certainly isn’t as evil as the stories and the build-up would have her be. Something obvious for the characters isn’t quite as obvious for the readers, and the other way around: something obvious for the reader isn’t as obvious for the characters. What is also a bit of a peeve is that when Croaker writes one cannot get a real sense of the personalities all around him, the characters tend to blend a bit. While in the chapters written in the normal third person personalities come through without trouble. Raven’s thoroughly disappointing death. Of course, even the most heroic people die in the stupidest ways possible, but the death was so stupid compared to the character that had been built up in the books that it became transparent. It was no shock or surprise whatsoever when Raven showed up once more. It wasn’t the most subtle thing in this book. Despite a rather odd ending – which will most likely be explained in the sequels – I completely enjoyed this book and the sequels are already bought and on my shelf. So yes, I really recommend this book!